Bariatric surgery is a last resort for people for who have tried to lose weight and failed. The procedure is performed in two ways. One method is through an 8-to-10-inch incision in the abdomen. A second procedure, called laparoscopic, requires several small incisions be made around the belly. The surgery takes several hours, with a hospital stay averaging three to five days. Recovery varies case by case, due to factors such as diet restrictions and medications. Obesity is an epidemic in the U.S and is recognized as a disease. In New York City, 34 percent of adults are overweight and 22 percent are obese. The number of Americans getting this type of surgery has been steadily growing, from an estimated 158,000 in 2011 to 228,000 in 2017, according to the American Society for Metabolic and Bariatric Surgery. The surgery tricks the body into believing that the patient only needs to consume one cup of food per day, instead of the usual four. Patients lose weight but they also may find it hard to get sufficient nutrients. 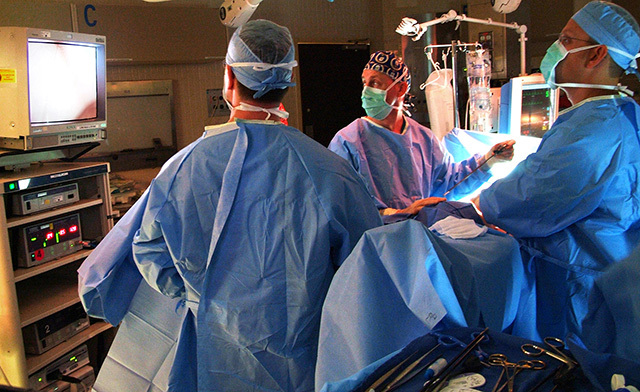 Bariatric surgery often leads to fewer health problems in the long term, but it also has risks. For patients with preexisting health problems, such as asthma, heart problems, and diabetes, the surgery can be problematic. Likewise, after the operation many patients suffer from metabolic issues, dehydration, and vitamin deficiency which may be long-term because part of the stomach is detached. Following the procedure, many patients have to stick to a strict diet to ensure that they maintain their weight. During the first four to six weeks after surgery, patients need to eat soft and mushy foods. Solid foods cannot be digested until the surgeon has approved it. Hydration is key for having a successful recovery. Most patients are urged to stay away from non-carbonated, caffeinated, and sugary beverages. High protein foods, such as eggs, almonds, and broccoli are recommended, for their nutritional value. Fresh fruits and vegetables like apples, oranges, and spinach are also recommended for fiber. The Bariatric Department at Montefiore Medical Hospital in the Bronx has a very successful surgery rate. It has been accredited as a comprehensive center for metabolic and bariatric surgery by the American College of Surgeons. In 2016, it completed over 1,000 surgeries consisting of sleeve gastrectomy, roux en y gastric bypass, and gastric banding procedures.